Giant Tangerine, with Grapefruit Overtones California Cocktail Grapefruit Very sweet, juicy, tender; purportedly a hybrid of mandarin and low-acid pummelo. The juice will blow your mind. I've got an orange, friend; looks like a grapefruit, friend Cara Cara Navel ("red navel" or "pink navel") pink pulp (comparable in colour to ruby grapefruit); seedless. Wonderful richness and complexity of flavour. I've tried both these fruits, and yes, the colour and juice are delightful. 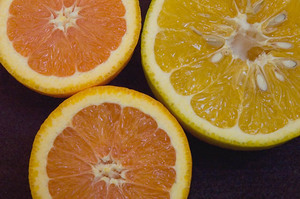 "Cara Cara" navel oranges are even better than the Italian blood oranges! Since "cara" is a term of endearment in the Italian language - the name is very well suited. Thanks for the education.